we grow up hearing a lot of advice on dating and marriage and single life. but adult friendships, that’s another story. if you’re like me, your friends are like family to you. they take a lot of effort, compassion, time, compromise, and understanding…but the payoff is totally worth it. topic: do you feel like it’s hard to make new friends as an adult? where do you feel like you’ve made some of your best adult friends? when you feel yourself drifting apart from a friend, how do we handle it? how much time do you expect from a friend? has a friendship ever felt more like an obligation to you? do you feel like it’s hard to make new friends as an adult and where do you feel like you’ve made some of your best adult friends? bri: living in LA, i feel like it’s actually pretty easy to find/make new friends that are doing interesting things (dating is a whole other story). there’s a very collaborative vibe here, so it’s pretty easy to get involved in activities with like-minded people. i met a lot of my best friends in my mid-twenties when i was really putting myself out there in my career and trying to get involved in as much as possible. most of my girlfriends are very independent, strong women who have a real passion for their careers and creativity. it’s our joke now, but i literally became best friends with jen by writing her an email and telling her how much i admired her work and i wanted to be a part of it. she will forever hold that over my head haha. natalie: in my experience making friends as i’ve gotten older can seem harder at times but the quality of friendship is more rewarding. i think if you find yourself in a place where you’re looking to make new adult friends (because you’ve relocated to a new town for example) you do have to make more of an effort than you might have had to in college. i’m lucky because i meet new people everyday through my job and have made many of my friends in los angeles that way. i’ve also met friends by participating in activities like ceramics classes and volunteer work which is something anyone can do and it’s a great way to meet people with similar interests. long answer short, you have to put yourself out there. joanie: i don’t think that it’s necessarily difficult to make friends as an adult but i do think that it’s more difficult to form really close friendships. true friendship requires time spent together and that’s hard to come by as an adult. in college, you spend every waking minute with your friends and you’re surrounded by people who share you same interests, in your classes, etc. but when you’re an adult building a friendship takes time, and that’s hard to do when people live across town, are married, have kids, etc. for me, making friends as an adult requires me being open and present. sometimes i’ll meet someone at an event, and we hit it off and just saying, “hey, we should get a drink sometime” is all it takes to start a friendship. erika: i find it challenging to make new friends and actually keep the friendship going. i tend to meet awesome new people and then can’t get over the hump of getting schedules to work out enough to where i can really get to know someone well. some of my best friends i have made are through friends of friends. it’s a great way to make friends that you can quickly connect with! wendy: i don’t think it’s hard to make new friends, usually everyone returns a friendly smile back. especially if you are in a setting where you share similar interests, it’s easy to dive into a conversation where it’ll eventually lead to becoming friends. but i also have a problem with becoming close to new friends because i have an inner circle of close high school friends (who i have known for over 15 years now) who have been with me through the good, bad and ugly. sometimes, just being able to let your guard down and be absolutely comfortable is key when you’re with a friend. when you feel yourself drifting apart from a friend, how do we handle it? bri: i’ve definitely had this scenario too and it’s not an easy one. breaking up with a friend can feel almost as hard as a breakup with a significant other. i’ve tried different approaches to this…letting them phase out naturally, ignoring (which is not the nice way to do it), and just having an open conversation about the friendship (usually best). this topic has always been very hard for me, because my friends are SUCH an important part of my life, so going in different directions always stings a little, even if it’s for the best. one of my biggest struggles has always been change. it’s hard when a friendship changes (someone moves, or gets married, or is into new things, or has a baby). i am such a creature of habit and so it’s been hard for me to accept that friendships take different forms. but i have really been working on that. i think my strongest relationships are the ones that have gone through phases. i have a few friends from high school that feel like my sisters…we can not talk for a few weeks or even months and it doesn’t feel like a thing changes when we see each other. natalie: i kind of approach friendship like a long term investment strategy. in most instances that i’ve noticed myself drifting from a friendship i’ve tried to resign myself to letting things take their course without attempting to remedy it too much. i’m not great with confrontation so this minimizes that aspect but i also try to keep in mind that people can come back in to your life as friends at many points in a lifetime. so if i sense drifting i try and think of it as two people headed on their own path and not see it necessarily a bad thing. sometimes people need space, sometimes you’re not in a place to share the same view point any longer, sometimes it just happens because everyone gets lazy about hanging out (i think this is very common in your early 30’s), sometimes major life choices take people in different directions. adult friendships can be complicated but if you don’t label the distance as a negative action than you can be open to that person coming back into your life further down the line. some of my very dearest friends have been ones that i’ve drifted apart from at some point for one reason or another and the fact that we have somehow reunited later in life makes the friendship even more special. joanie: i think at first i put in a lot of effort and try and make things right between us and then if it really isn’t clicking anymore i just let it go. especially with far away friends, i’m really not great at staying in touch long distance. i think friendships have a cycle and that sometimes you’ll feel really close and sometimes you’ll be more distant, and that’s okay. people’s lives go in different directions and just because you were great friends at one point doesn’t mean it will always be that way. i’m deeply loyal though so i’ll always have love for people who were in my life even if we’re not still close. erika: everyone is so busy these days it’s all too easy to drift apart. i try to plan a few parties ahead of time so that even if we end up getting busy and losing track of how time flies by, there’s a few definite dates every few months we can all reconnect. wendy: as an extrovert who gets my energy from people, it was hard to accept friendships drifting away as life got busier. but i quickly learned that it’s all about balance and effort. if they’re special to you (and vice versa) you’ll both understand that life’s obligations just comes first now and it’s nothing personal. eventually, those who matter will make the efforts despite the busyness and everyone else will become acquaintances. definitely a believer in quality over quantity for adult friendships. how much time do you expect from a friend? bri: up until my late twenties, i would find myself getting into the pattern of getting extremely close to one friend and relying on them a lot. (this is starting to sound like a therapy session isn’t it? ha) i’ve always been a very social person and like to have a lot of friendships…but i tend to like to be super close to one person. where they know all your struggles and successes. sure, maybe even a little co-dependent. when i got older i realized this wasn’t a healthy way of going about life. at the end of the day, people are always going to let you down if you put too much weight on one person. i didn’t really understand that, i thought closeness like that was what life was all about. then i learned a little thing called BALANCE! learn to love yourself, have your friend that you get brunch with, have your friend you like to workout with, have that friend who loves wine and a nice meal, have your creative friend, have group events with lots of friends. of course we are going to naturally be drawn closer to some people, but balance has been the key to healthy friendships for me. (and clearly, this is something i’m still thinking about a lot) i would say as far as expectations from a friendship, i just require a genuine effort. we all get busy so it’s completely understandable. but it’s important to make time for your friends, even if it’s just a quick phone call or a nice text. one thing i can’t handle in a friendship is someone who is always flakey…no thanks! natalie: for me friendships just have to have a general sense of reciprocity. each friendship is unique and has time requirements that differ from another. joanie: not very much. a dinner or drinks date every couple of weeks, a few texts during the week, maybe meet for a yoga class but that’s about it. erika: as i’ve gotten older i’ve come to expect a lot less time from friends because everyone is so busy with work and i know we all make our best efforts to see each other. for me it’s less about the actual time and more about being there when needed. if i’m too busy to meet up but i know my friend is in need, i always make sure they know i’m a phone call away. i think it’s really important that you always make time, but not necessarily feel obligated to give them ALL of your time. wendy: depends on the friend. some friends are easier to keep in touch with since we attend the same outings. but i try my best to keep in touch throughout the week and get face time every other month or so with most of my friends. has a friendship ever felt more like an obligation to you? bri: yes, and that’s hard! i tend to have a guilt complex, so i will hold onto things that aren’t really working for too long. i’m also a loyalist to the core and don’t like letting people down. again, getting older and realizing we have to take control of our lives and approach those scenarios head on. if something doesn’t feel right, don’t avoid it. either fix it or let it go. we only have so much time in our busy days, friends should feel like a fun bonus to our lives, not an obligation! natalie: not at this point but this was definitely more of an issue in my 20’s and that may be part of a natural progression into adulthood. when you get out of college it’s hard to imagine that friendships can change and not being prepared for that reality can stir up lots of emotions, especially if you don’t even know what your expectations of friendship are. 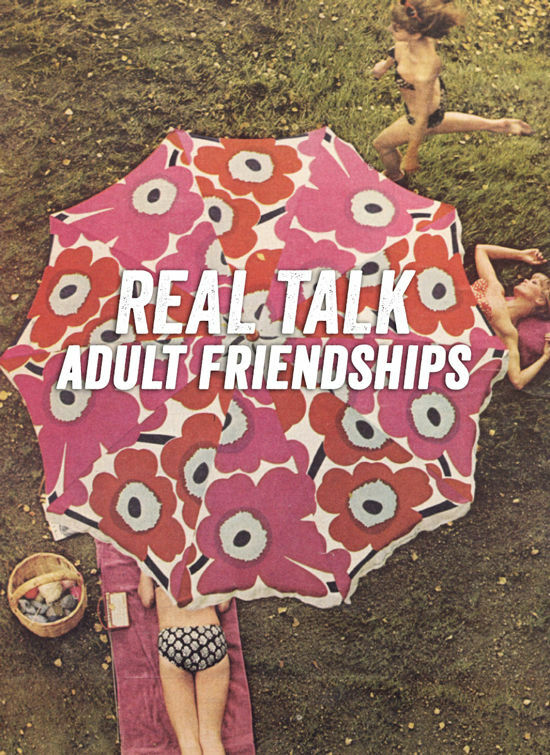 in this day and age we are used to very open discussions about how to have healthy romantic relationships and verbalize those expectations, but maybe we don’t address healthy adult friendships enough because they take work too. it’s very important to have respect and love for your friends and feel that from them in return. if a friendship starts to feel like an obligation than it’s time to re-evaluate. joanie: there are definitely times in my life when i’ve felt the weight of friendship. i’m very sensitive so i pick up on other people’s struggles and emotions and if something isn’t right between us i know immediately and i can’t stop thinking about it until i fix it. i require a tremendous amount of emotional honesty in my relationships, i can’t handle an elephant in the room or unspoken upset. erika: of course, but usually when a friendship feels like an obligation it’s a sign something isn’t right. i try to reevaluate the situation and really be honest about what’s going on. do they really need me right now? are they just taking advantage of our friendship to vent to me about only their struggles? i think you should give them what you can and know that sometimes you just outgrow a friendship. it’s hard but i think you’ve either got to ride it out or cut them out. wendy: yes. when a friend is being especially clingy, (and not because they’re going through something) but because they just need someone constantly by their side. not to say i don’t like being there for them, but as adults, it’s so hard to invest all of my time on one friend.. let alone one thing. luckily, it’s rare when that happens (thank goodness for boundaries) so most of the time, i sincerely look forward to spending time with my friends. we’d love for you to join in the conversation!! This is interesting. I’ve been thinking about this topic a lot myself. I went through a stretch where making friends was really hard and I didn’t have many. But now I feel like I’m connecting with so many great people that share common interests and who I genuinely like and like me. It’s really awesome and I’m having so much fun connecting them to each other, etc. But now I feel that I don’t have as much in common with some of my older friends. I would like to bring them into these newer friendships, but they aren’t interested in the same things. Of course I’m not going to abandon them—we’ve shared so much. I think it’s just the natural ebb and flow. I can have my new friendships with all the things we’re sharing and learning, and the old friendships that root me and know me so well. I need to make sure I’m still investing in those older friendships even when they aren’t as exciting as the newer ones. Great subject to bring up right now… I have been thinking a lot lately about the friends I have or have had in the past. I’ll try not to write an essay here… Up until I hit my 20’s I could never keep a friend more than a few years. I always was changing so fast that my friends eventually moved on to other people. Seeing so many people around me now, that I’m nearing 26 years and them explaining or introducing their forever friends back from their middle school or high school years tends to get me thinking as to why I never kept these friends. I find it incredibly hard to keep friends now and only have a select few that I am close too. As an introvert I tend to feel over stressed if two friends happen to want to hang out on the same weekend. I tend to close in on myself easily, I could go a month without seeing a close friend and it not bother me. Most people tend to not understand why I do this and take it the wrong way. Same goes with family whom are hurt if they haven’t seen me in a while. Sometimes having a friend doesn’t mean spending every week with each other, it’s just knowing they are there. Bri, I identify with you all the way! But everyone had great shares here. As someone who lost what felt like all of my friends a few years ago as a result of one major relationship breakup, I have found it challenging to rebuild. I have learned that part of that reason is that I really needed time to heal – and that truly takes longer than we like it to! I am now seeing that healing process more clearly, and expecting to see the best friendships of my life coming during the second half of my thirties. That’s a genius app idea! This concept has been haunting me for the last few years and it is so interesting to see everyone’s perspective. For the last 10 years, my core friend circle has been my high school friends, whom I’ve been through a lot with. However, I’ve grown and changed a lot as a person and I don’t connect with them as well as I wish I would. I will say adult friendships are definitely harder for the introvert! There aren’t as many social activities I attend, and few people have the time to build that deeper relationship I desire. I think the most important discovery I’m made is quality > quantity. OMG this spoke to me so much! I’m 27 and for the last 1.5 years I’ve felt like many of my close female relationships have been in flux. People are so busy with relationships and work that it’s hard to find time for each other. I live in SF and I feel that meeting new people is easy, but converting people you know into people you’re friends with is difficult, but I’m working on it! best article I’ve read in so long! I’m 25 and I’ve been slowly learning to let go of childhood/high school friendships, but its been the biggest struggle for me! Its especially hard because I grew up in a teeny town in Texas where everyone stays so close for years and years, but I moved away so long ago and have slowly lost touch with friends that used to feel like sisters. It feels like a part of me is missing sometimes! But I love what Joanie said about friends coming and going at different times in our lives and thats OK. Sometimes we’re at a point in our lives and don’t connect like we did before, but it doesn’t mean it will last forever. I’ll always have a special place in my heart for the friends I grew up with! This really resonated with me today. I love this article, it feel like really thoughtful and meaningful content. Just what I’ve been looking for. products are a great idea. be a little tedious once the cameras ended up set to sequence.